When a friend said she was going to throw a small surprise party for her husband’s fiftieth birthday – I offered to make the cake. Last October just before I started this blog I had a whole run of making celebration cakes – starting with friend’ s two tier wedding cake and ending with my son’s, relatively simple, yellow birthday cake with chocolate sour cream frosting. I learnt a lot about layer cakes, averting disasters and Swiss buttercream. With the heat and humidity of February still on my mind, I didn’t want to descend back into a swirl of Swiss buttercream or other fancy frostings. 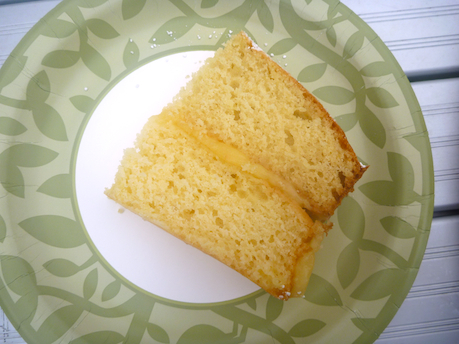 I decided to keep it simple and make one of my old favorites – Greek yoghurt cake with lemon curd filling. This cake very moist and light, copious amounts of butter and yoghurt give it a wonderfully velvety texture. 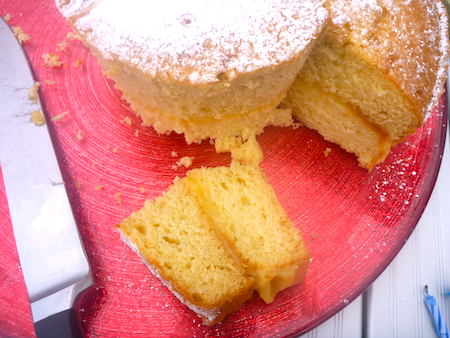 It can be served plain as an everyday cake but made as a layer cake with a lemon curd filling and a dusting of icing sugar, it’s celebratory without being too over the top. It’s also a good keeper which is essential when I’m making a cake for a party. I invariably make too much cake and it’s nice to know it can be frozen or eaten in the week following the party and won’t go soggy and inedible from cream and fruit fillings. This recipe comes from Jill Dupleix’s book New Food, which was published in the mid nineties. As was the fashion then, it’s a big format book with a lot of annoying, over produced design features. But it is a book I still use – there’s lots of slow roasted tomatoes , cous cous and pinenuts with everything. (Slow roasted tomatoes were like the kale of the nineties). The cakes are all show stoppers particularly this Greek yoghurt cake, a classic, which ever decade you decide to make it in. Note: For my friend’s party I made two batches of this cake separately and baked them in a 30cm cake tin. The following recipe can be baked as a single cake in a 25cm cake tin or as a layer cake in two 23 cm tins. 1 1/2 cups of natural yoghurt. Preheat oven to 180 C (350F) or 160 degrees fan forced. If you are making this as a layer cake set your oven 10 degrees lower than the recommended temperature. The cake will bake flatter and won’t dome or crack as much. 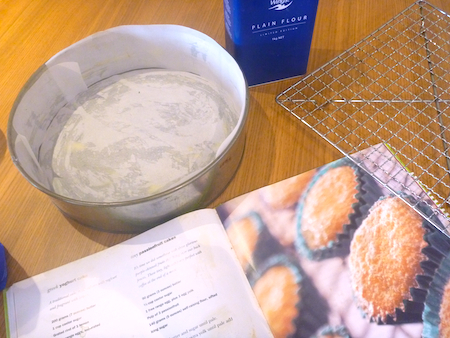 Sift together twice – flour, bicarb soda, baking powder and salt. Cream butter, sugar and lemon rind until pale and creamy. Beat in egg yolks one at a time until well combined. Fold in yoghurt and flour in alternate batches starting and ending with flour until it is all combined. Beat egg whites until stiff and gently fold into mixture. Pour into a greased and lined 25cm tin or two 23 cm tins. Bake for 45 to 65 minutes, depending on size until a skewer comes out clean. Cool and dust with icing sugar or ice with home made lemon curd. If you are making a layer cake take the nicest looking cake for the top. Even up the bottom layer by slicing off the domed top with a bread knife. Slather with lemon curd, then put the other cake on top. Dust with icing sugar just before serving. Note: I like this lemon curd recipe because it’s simple, fail-safe and uses whole eggs so you don’t have to work out how what to do with spare egg whites. Add lemon juice and stir over a low heat for 15 minutes until the mixture thickens and coats the spoon. It will continue to thicken as it cools. Pour into a clean glass jar and chill. 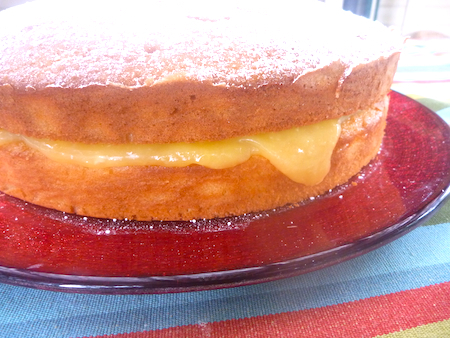 I can vouch for both the deliciousness and ease of Elizabeth’s lemon curd recipe having used it when making a citrus flavoured wedding cake for my cousin last July. It was a huge success, a refreshing change from the usual frosting. I love that it uses whole eggs, too, so no wastage. Oh my god how delicious does that cake look. Have to try it for sure. I have never cooked with Lemon curd before. Brought a jar of Organic lemon curd (hiding my head in shame) thinking I will try something before I graduate to making my own. But it is still in the fridge waiting for the D Day. You should definitely try it with the curd already made you’ll have a celebration cake in no time.